Titel: "Notes of Seven Decades"
vergriffen / out of print. Titel: "For Inner and Outer Peace"
Beschreibung: "Frieden" - ein Thema, das ihm w�hrend seiner letzten Lebensjahre sehr am Herzen lag. Titel: "Antal Doráti and the joy of making music"
Beschreibung: A centenary tribute to one of the most celebrated conductors of the 20th century. 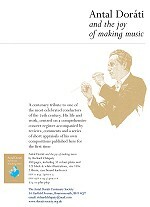 His life and work, centred on a comprehensive concert register accompanied by reviews, comments and a series of short appraisals of his own compositions published here for the first time.